She collected and edited every written word she could find. In 348-pages his actual quotes on all aspects of life and disciplines- a fascinating look and read into the mind of one the worlds great thinkers. Darwin was a botanist, a geologist and a caring husband and father. As an active correspondent, he once told his cousin that he liked to play billiards because “it drives the horrid species out of my head.” Browne’s book offers and intimate look at Darwin at work, at home, as a public figure, and on his world travels. Feel his humor, frustrations, exultation’s and “the mans special genius. His travels on the ship; the Beagle made history, and changed knowledge on all living things great and small, for all times! 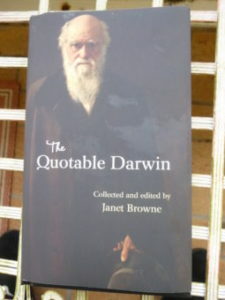 The book offers a chronology of Darwin’s life by Browne’s, THE QUOTABLE DARWIN. It provides an engagingly new perspective on a remarkable man who thought heavily about the natural world. Natural Selection and Evolution became hot topics due to Darwin! Photos of the Week! → ← Country Inn & Suites By Carlton, Port Charlotte, FL.